888poker’s XL Blizzard offers plenty of value opportunities for grinders on a budget. There’s a lot that goes into creating a poker series, online or live. In general, companies want to cast the widest net possible, making the event exciting for players of every bankroll level. 888poker does a very good job of this and the 34 events of the upcoming XL Blizzard on January 18-28 is no exception. Sure, there’s a solid group of big-time tournaments for the high rolling set, but what about those players who are on a tighter budget but would still like to play for bankroll boosting score? 888poker didn’t forget about their core base of players and so we’re here to spotlight five “can’t miss” tournaments for the true grinder. If you can’t find your way into the larger Event #1 the $109 buy-in Opening Event, the Mini Opening, Event #2, is the next best thing. The buy-in to guarantee ratio is definitely in favor of the player in comparison and just because one is not playing in the latest event of the day doesn’t stop them from taking advantage of all of the extra promotions, including bonus cash for both multiple wins and cashing in eight or more tournaments. With a very likely four-figure first place prize, a victory here could put you in contention for some serious XL Blizzard money. Boasting the cheapest buy-in for the entire series, Event #7, the Mini Crazy 8, is sure to draw a large field. Like their World Series of Poker counterpart, the Crazy 8 tournaments seem to really draw a crowd. Again, the buy-in is 1/10th of the larger Crazy 8 tournament and but the guarantee is roughly 1/3rd making it a complete value tournament no matter what stakes you usually play. With only a $12 buy-in, Event #11, the Mini Tune Up, carries the largest guarantee of any tournament on the schedule at this relative buy-in. The tournament is in the middle of a day that includes the $200,000 Whale and so it’s very likely that the field could be a robust one and should the guarantee get smashed the final few will be looking at high four-figure and maybe even a five-figure payday for less than a ticket to ‘Molly’s Game’. The $5 price tag is a little misleading as there are rebuys and an add-on in this tournament. But should you run hot early, while others are busting and rebuying, this could be a high-value tournament. Catch fire and practice a little bankroll management, without falling into the contagious mindset of shipping super light and crossing your fingers and in the end perhaps you 100x your buy-in. But should you get doomswitched and, in turn, stubborn, this could turn from a $5 dalliance into a minor money pit. Event #34, the final event on the XL Blizzard schedule, has the lowest buy-in during the last four days of tournaments but it should be a good one. With more of a mid-stakes price point the Micro Main comes with a healthy $50,000 guarantee, which very well could be shattered as players make a last ditch effort to find their way into the Champion of Champions tournament with hopes of winning a World Series of Poker Main Event package. When all is said and done, of all the smaller buy-in tournaments, this is the most likely to pay out five-figures to the winner. 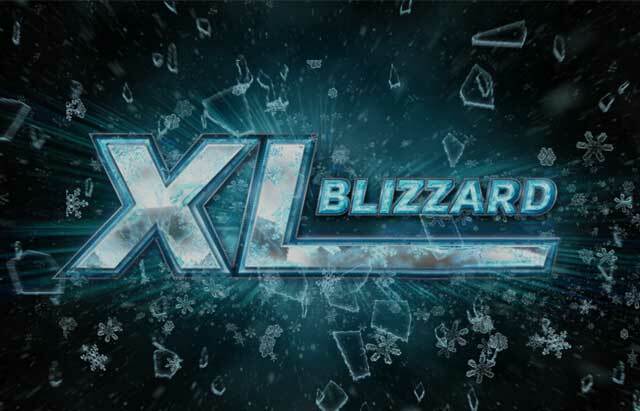 If these look good but you are looking for tournaments that come with a little big of a higher risk/reward ratio, don’t fear – you can check out these Five Big-Time Tournaments on the XL Blizzard Schedule and plan your winter week accordingly.